This feature programmatically adds the Log Error or Message function in your LabVIEW Code. 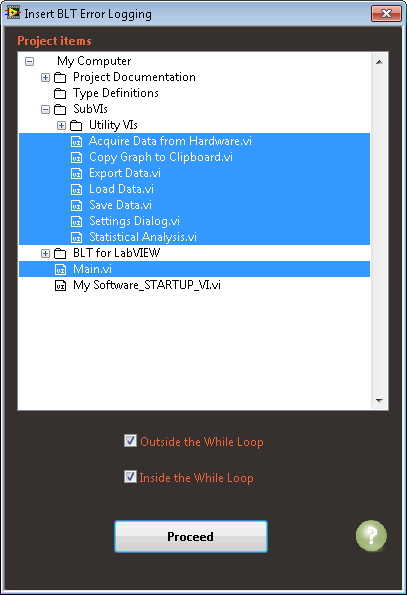 See the section Using the BLT API for LabVIEW for more information about this function. oSelect the VIs where you want to add Error tracking. You can select multiple items by using the Ctrl key of your keyboard. oClick Proceed to complete the process. This will look in your VIs for existing error indicators. You must have error cluster indicators named "error out" in your VIs for this automatic insertion to work. 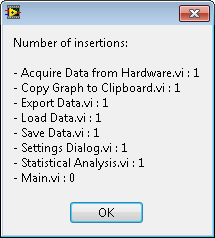 oAfter the process is complete, check the number of insertions in your LabVIEW code.